I just wanted to say thank you, thank you ! I stopped by yesterday, picked up your $50k donation check and was able to deliver the payment in full for the truck acquisition by 2 pm yesterday, thanks to Lerner & Rowe! This morning I took one of the store managers to the dealer and we “officially” took delivery of the truck. It is in immaculate condition and is a great find. 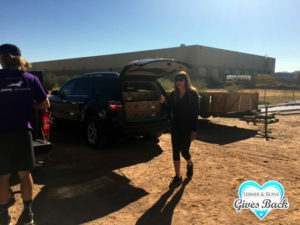 We are truly grateful and the guys were so impressed with the new truck… it was like an early Christmas gift for them, as this group has been operating with the truck whose air conditioning ONLY worked when you let off the gas. It was a hot summer for the team. We took the truck to Beaver Stripes and met Mike and the boys, who do amazing work. We will be providing the final artwork for both you and the Habitat team once again, before we complete the process. They said it would take only one day to do the wrap and they are going to work with us on the pricing!! Again, we are just so thrilled and honored with your support. Lerner & Rowe has such a great history of reaching out to the community, from kids to vets and more, you guys truly do it all. Habitat for Humanity feels very privileged to now be a part of your outreach! Best to you and the family for this holiday season. We will keep you posted on our progress and send photos, once completed. Thank YOU for helping Habitat build a better world! Sue and Nicole had a great time at the Golf Tournament on Friday. Heard it was a GREAT success. 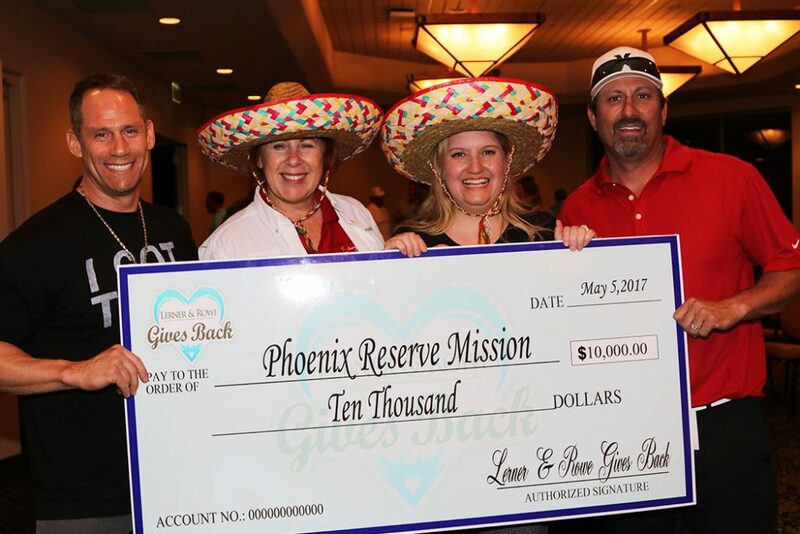 Thank you so much for including Phoenix Rescue Mission as one of your Foundation’s charities. As always, Lerner and Rowe Gives Back starts off PRM’s Code Red with a bang. With your support, PRM will SAVE MORE LIVES. 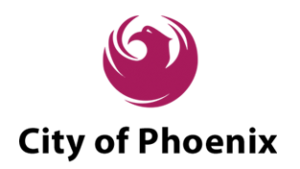 I would like to invite you and other L & R employees to ride on the Hope Coach sometime so you can experience firsthand how we serve the homeless who are stuck on the streets of Phoenix during the extreme heat of the summer. I guarantee it will be a life-transforming experience. Hope Coach goes out most mornings from 9-12. Please contact me to help arrange a convenient time. 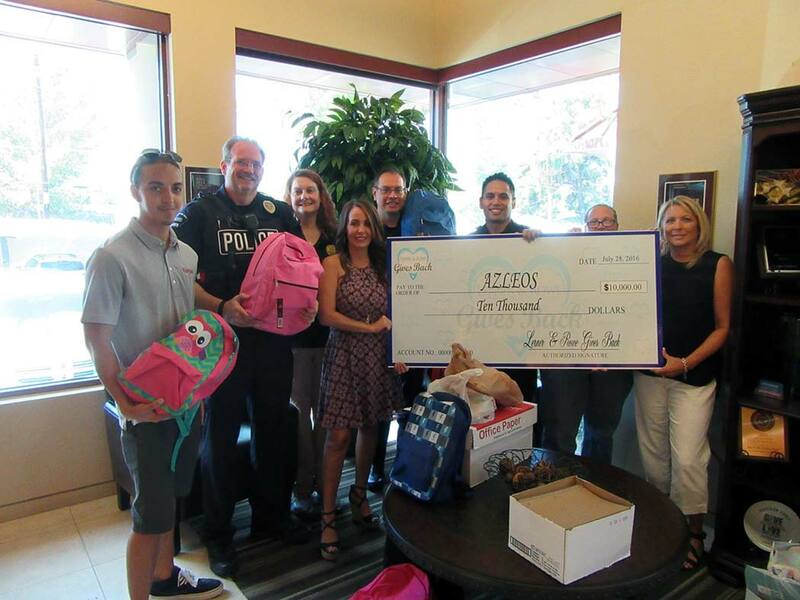 Lerner and Rowe Gives Back ALWAYS comes through for Phoenix Rescue Mission. Each year you raise the bar higher and allow PRM to help more and more people in need. 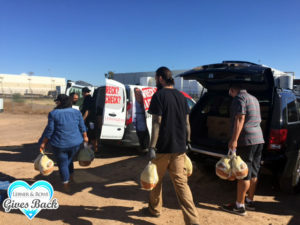 Last Saturday, Lerner and Rowe Gives Back sent 12 or more dedicated employees to not only pick up 450 turkeys at Bashas but also unpack them again at our Community Service Center. That was quite a chore. Our final turkey count for last Saturday was 832 which means that L & R Gives Back provided OVER 50% of the turkeys collected on Frozen Turkey Saturday. Because of Lerner and Rowe Gives Back’s generosity, 450 families will experience the blessing of a delicious homemade Thanksgiving meal to be shared with friends and family. 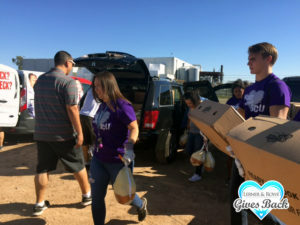 This upcoming Saturday 11/19 over 100 volunteers will hand-deliver each turkey that we collected along with a food box containing all the Thanksgiving fixings to families across the Valley. These volunteers will interact with the families, making sure they are doing OK, giving them HOPE and even will pray with them if they so choose. On behalf of our Board of Directors, Jay Cory our CEO, PRM’s enthusiastic staff, our dedicated donors and especially the clients we serve, thank you for your faithful support which allows PRM to complete its Mission Statement to “Provide Christ-centered life transforming solutions to persons facing hunger and homelessness”. May God bless you and all your employees for your generosity and compassionate heart for The Least, The Last and The Lost. Kevin and I would like to thank all of our staff for volunteering their services this morning at Paul’s Car Wash 2016! 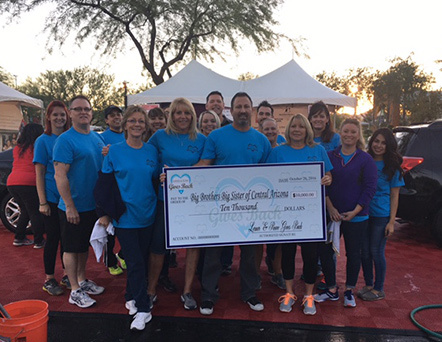 Thank you for getting up at 3:30 AM to be there at 4:30 AM to wash cars for a great cause, Big Brothers Big Sisters of Central Arizona. We are writing to express our deepest thanks for your recent donation to the Tonto Street Church Back to School Giveaway. Generous gifts from donors like you provide the financial support needed to continue our mission. With your faithful financial contribution, you’ve demonstrated your deep commitment to help provide school supplies and back packs to low income children in Central City South. There is no way to fully express our gratitude for your kindness. We are continually inspired by the dedication and generosity of donors like yourself who answer the call to give again and again. We look forward to a continuing partnership with you. We have included an article from the August/September 2016 Central City South-A Community for All Ages newsletter that includes pictures from the event. Thank you for your support! We know you have many options for your philanthropic dollars. I would like to thank you for choosing the National Fallen Firefighters Foundation (NFFF). Your recent gift of $1,000.00 for the 2016 Salt River 9/11 Memorial Stair Climb extends your reach. No matter what program you wish to help with your giving, your gift touches many in the fire service and beyond. As we look to the future the NFFF faces even more challenges and your support is critical to our ability to carry out our mission. Your support of the families and coworkers of America’s fallen fire heroes makes a difference in their lives. The NFFF is a nonprofit, tax-exempt, Section 50J(c) (3) organization. Please let this serve as written acknowledgement and substantiation of your charitable contribution for federal income tax purposes. No goods or services were provided to you in return for your contribution. 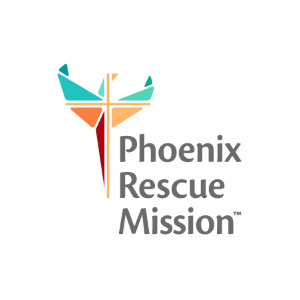 Thank you SO MUCH for sponsoring the “Come Together” Concert which will benefit Phoenix Rescue Mission. Your $5,000 gift will help provide food, water, clothing and most importantly HOPE to the homeless and hungry in our community. 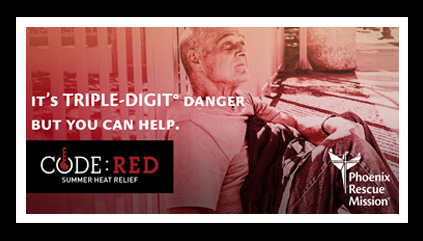 Every year in May, Lerner and Rowe Gives Back’s Golf Tournament is the unofficial start of Code Red Heat Relief. 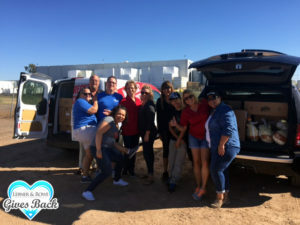 With partners like YOU, I am pleased to announce that Code Red 2016 raised $1,000,000 for Code Red AND we collected over 1,000,000 bottles of water to distribute to keep people alive on the streets during our blistering summer. Can you imagine how many lives that saved? On behalf of all the men, women and children that we serve, thank you for your heart for The Least, The Last, and The Lost. Thanks for all the great supplies; there was a lot of nice stuff. 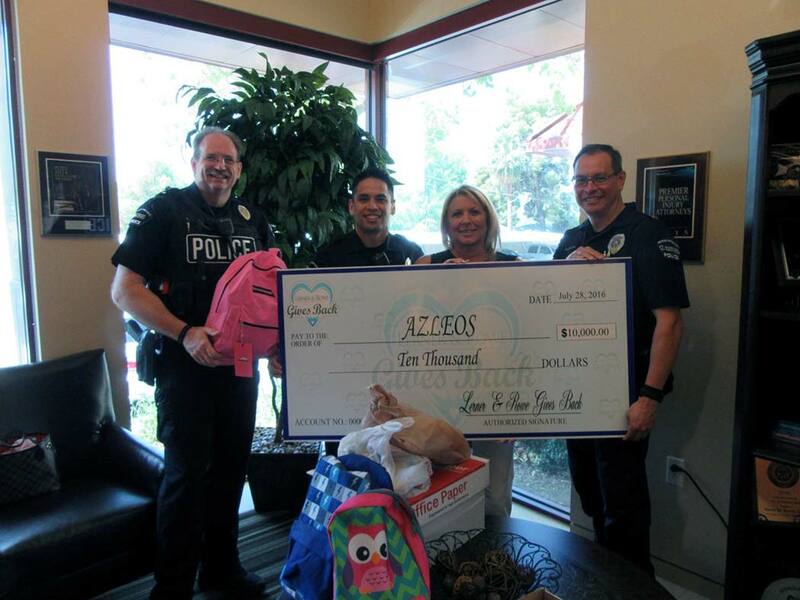 Our officers are very excited to be hand delivering these back packs and getting to meet the kids one on one. We do believe that healing our community will come through our officers and kids making bonds at an early age. Our organization is committed to making a difference through community policing. With companies such as Lerner and Rowe and Right Toyota and Right Honda, we see a bright future for our kids and our country!